Beth - don't you mean she "rode" the ride? Nice outline here. 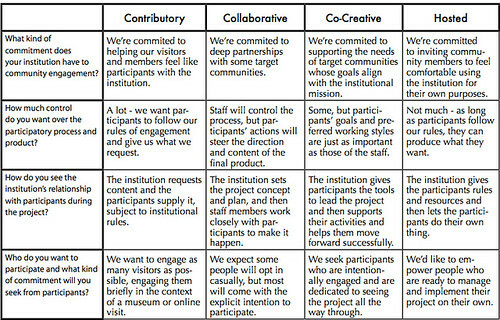 I did a similar one related to communities of practice as applied to a nonprofit environment. My question regarding this one is this: What if your organization falls into different categories for each of these questions? Do you go with the one that has the most chosen in a column/category, or do you choose different activities related to the columns in which the organization shows the most strengths? Of course, there is a lot of inherent overlap, as you mention here, which defies a clear cut answer, so some of this is building a willingness in the culture for experimentation and tolerated failure until you hit the right formula. Of course, that's going to vary from project to project as well as over time as new capabilities and needs come into the picture. I'd love a book, of course, but I'm not sure that this comment qualifies, since I haven't explicitly shared examples. As Dianna said, great outline. And although each of the four models touch on it, and I'm sure you've considered it, but how would a fully crowdsourced model effect the project - including project management and implementation? Actually, I'm thinking about the act of consulting - and how this applies and shifts through the stages of a consulting relationship. At Cause Effective, we work with community-based nonprofits to help them reimagine their funding base and often can see options they can't visualize at the start. They ask us to find money for them and we come back with uncovering all their hidden friends (which, of course, ultimately leads to $). My point is, there's a fine line in defining a consultancy inbetween co-creation or respectful collaboration - and having the infra-red consultant goggles which trump (if the group is indeed to move beyond their comfort zone). I guess this didn't answer the social media part of the question - but in fact we are facing this very part of this question in re-purposing our social media strategy (including our blog www.CauseEffectivePerspective.net, which has great content but a silent community) - we are thinking all this through collectively right now. This is a wonderful framework to guide action. I work a lot with action research/learning/inquiry which has various modes of participation, and this frame is very helpful for that field. I recently had a discussion with some global multi-stakeholder change networks that deal with "certification standards"...think FairTrade coffee, FSC-labelled forestry products (Forest Stewardship Council) and MSC-labelled seafood (Marine Stewardship Council). I pointed out that they are inconsistent in their use of "multi-stakeholder processes", and wondered why. For example, they all have multi-stakeholder global boards, but when it comes to actually certifying a specific producer the process is entirely technocratic: an auditor interviews stakeholders individually. In the blog about Nina, you claim "transformational experiences are possible in every type"...but what do you mean by transformation, and are they really, and if transformation is the goal, surely these processes are not equivalent. This brings to light that there is another row needed, that asks "What is the goal for participants"...oddly, there's one for "non-participants" only. When I say "transformation", I mean the shift in insight about how "one is" vis-a-vis others and a change in relationships that means change in power and what can be created together. For this to occur between organizations as well as individuals, the "contributory" model doesn't get you there...to take the certification examples in hand, they're applying the "contributory" model for stakeholders involved in a local product's certification, but to realize "transformation" in the stakeholder relationships locally they need an approach similar to the one they take globally...a co-creative process for planning and managing the resource. 2009 Nobel Laureate in Economics, Elinor Ostrom, writes a lot about this approach. I love this chart!! Great jumping off point for considering key questions around community networks. Is there a free-standing or enlarge-able, or downloadable version anywhere? Thanks Beth! I'm coming a bit late to this discussion, but here are some thoughts (and a downloadable PDF version of the chart). You can download a pdf here, or you can see the chart in context by reading the full chapter it comes in here. @Dianna, I've found that the chart works best on a project-by-project basis. The question of which model to use frankly comes down to staff personalities more than anything else. You can't "force" someone to accept a co-creative structure if he or she feels the need for more control over a project to make it successful. I've often worked with organizations that have pockets/departments working with community members in different configurations. Sometimes there are issues--particularly if community work in general is seen as inferior to "professional" work--and the most successful organizations are those in which staff can talk honestly and openly about their personal challenges to working more collaboratively. @Steve, thanks for your articulate comment - in the context of your definition of transformation, what you say makes a lot of sense. In a museum/arts/learning context (the one in which I primarily work), transformation may be about self-concept as an artist or new connections to content or other people. For example, the Denver Community Museum, which featured exhibits produced entirely from public contribution, was a contributory project that had transformative power to help participants see themselves as makers and co-owners of a cultural experience. I do agree with you that another row is needed. Frankly, in the museum field, we have a real problem with participatory projects that are almost exclusively focused on the participants' own experiences and personal evolution. I believe that participatory projects will only become valued on a broad scale when they are seen as more than just personal experiences for a few participants but are also built into the work that the organizations do for the vast number of people/visitors/customers who are served every day. Beth and Nina, what a great and educational post. Learning about these kinds of differences and participation opportunities for stakeholders is always very valuable to me. Hope to read more posts like this in the future. I would like to create a video project that is collaborative in order to attract more members and to influence the members we already have.